A practical perspective of surrender and humility. We were made to be dependent on God alone. In the real world, this lifestyle, humility, has no straight-forward approach. Because we all are different and come from varied backgrounds, the Christian lifestyle can seem difficult to understand, much less navigate. The Legitimate Christian Life focuses on the core of Christian lifestyle, which is a real relationship with God. 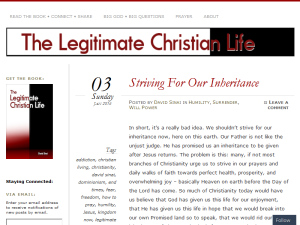 This what your The Legitimate Christian Life Blog Ad will look like to visitors! Of course you will want to use keywords and ad targeting to get the most out of your ad campaign! So purchase an ad space today before there all gone! If you are the owner of The Legitimate Christian Life, or someone who enjoys this blog why not upgrade it to a Featured Listing or Permanent Listing?